We cannot hold back our excitement! 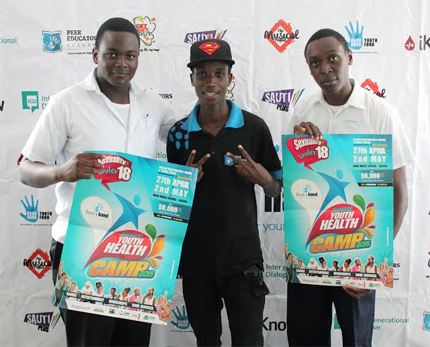 The Sexuality Under 18 Youth Health Camp is just a few days away. This year, we anticipate 800 young people, from all over East Africa, eager to learn about Sexual Reproductive Health and access services, to make informed decisions in the future. This will be at Hana Mixed School, from 26th April to 2nd May, 2015, at 50,000shs only per student, between 13 to 24 years old. We are also privileged to have a number of organisations and individuals passionate about empowering young people joining us for the Camp. A number of mini workshops will be happening every afternoon, where young people will be equipped with life skills, access resources and widen their network. Young people will also participate in a community outreach, where they will mobilise the Nsangi community to come for HIV testing and STI screening. People who will be found infected are guaranteed of proper medical attention and monitoring, because Baylor Uganda is directly handling the medical check ups. With the guidance of their teachers and RAHU peer educators, sixteen schools have come up with plays that communicate the challenges faced by young people in schools, repercussions of bad choices, and the hope for another chance even after a wrong turn.The best three schools will be awarded accordingly. Parents, teachers, local leaders and other stakeholders are invited for the closing ceremony of the camp, on Saturday 2nd May, from 11:30am to 1:00pm. This will be an Intergenerational dialogue where they will interact with young people, know the impact the camp has had on them and they will have an opportunity to hear from them what affects them and together come up with lasting solutions and suggestions for policy reforms where need be. Everything is set, the team at Hana Mixed School cannot wait to host us, and our partners cannot wait to meet and interact with the young people. Special thanks to MTV Staying Alive Foundation, Segal Family Foundation, Crown Beverages, DSW, Baylor Uganda, Events WareHouse, NBS TV, Hana Mixed School, KiBo Family Foundation and Standard Chartered Bank. Follow the trending hashtag #SexualityU18 on Twitter and Facebook.